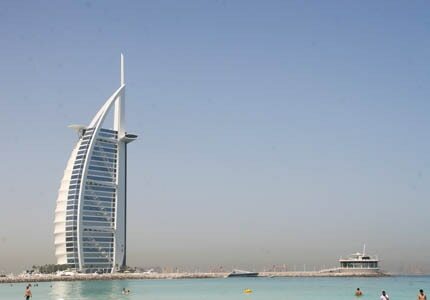 The United Arab Emirates (UAE) is a federation of highly prosperous emirates on the Persian Gulf, due to its wealth of oil and natural gas. The seven states include the popular tourist destinations of Dubai and Abu Dhabi, which have experienced monumental growth over the past few years. The emirate's main revenues are from tourism, trade, real estate and financial services. Dubai is situated within the Arabian Desert, yet is also situated on the Persian Gulf coast and shares borders with Abu Dhabi in the south. The region offers a cosmopolitan lifestyle, as well as tax-free shopping, exotic sporting events and quality entertainment. Towering more than 160 stories over Dubai, Burj Khalifa stands at 2,723 feet tall and has become internationally recognized as an architectural icon. Savor Continental fare with an Asian twist in Eauzone's oasis-like setting of palm trees and an aqua-tiled pool at the One&Only Royal Mirage. The massive $4.5-billion terminal features striking design and a range of luxury amenities befitting a gateway to the futuristic city of Dubai. Dubai-based Emirates became the world’s largest operator of Boeing 777 aircraft with the addition of a 78th plane, a 777-300ER configured for long distance journeys. This unique property has been designed to emulate a Bedouin encampment and offers an exotic mix of sand dune views and luxury. The international airline company has recently introduced tri-weekly, nonstop service from Dubai to Los Angeles and back on Boeing 777-200LR aircrafts. Exotic location in the Liwa Desert outside of Abu Dhabi. The highest class of open-wheel formula racing sped into Abu Dhabi in the Fall of 2010. Check out all of our featured races.